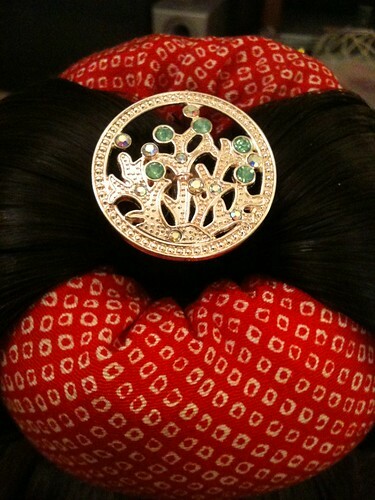 The purpose of this lesson is for you to learn about the various hair ornamentations that are worn by geisha. By the end of this lesson you should be able to provide a general definition of KANZASHI and give a brief history of the art of hair ornaments. You will also develop an understanding of the basic types of KANZASHI and learn the relationship between the type of KANZASHI and the months of the year. Kanzashi are hair ornaments used in traditional Japanese hairstyles. They came into being when women adopted more defined hairstyles, giving up long, straight hairstyles. During the Edo period, artisans began to produce more finely crafted products. Some believe Kanzashi may have been used for defense as well. brides, geisha, and special occasions, even young women who wish to add an elegant touch to their business ensemble. Bira Bira – fluttering or dangling style, these have metal strips attached by rings to the body of the ornament so they move independently, pleasantly tinkling, and sometimes adorned by bells or long chains of silk flowers called shidare. Kogai – chopsticks style, these are special hairsticks that pull apart in the middle so that they may be more easily inserted into the hairstyle. They are often worn alongside a KUSHI or comb. Originally Japanese men as well as the women wore these. Geisha are not permitted to wear more than one pair at a time. Kushi – comb style, usually rounded combs of lacquered wood or tortoise shell and may have inlaid mother of pearl or gilding. These were most often worn with the mage, or bun-style hairdo. The spine of the comb is wide and often the design extends onto the comb itself. There are also "flower combs" HANAGUSHI where folded pieces of silk are glued to a wooden base comb. The Hana Kanzashi is the long, fluttering flower hair ornament that is characteristic of maiko. Japanese artisans use squares of silk and a technique known as tsumami where the silk square is folded multiple times using the aid of pincers and cut into the shape of a single petal. Attached to metal backings, whole flowers are made or strings of silken blossoms are created to grace the maiko’s hairstyles. Butterflies or birds are commonly created in this art form. Geisha wear different Hana Kanzashi according to the month or public holiday. In the summer months (June to September) jade ornaments with white or silver themes are worn. In the winter months (October to May) tortoiseshell and coral kanzashi are worn. The seasons dictate the type of hair ornament worn in Japan. Usually this applies to geisha as well as maiko, but most important for maiko as they wear more hair ornamentation then seasoned geisha. Here is your assignment for this lesson - Make your own paper kanzashi in real life! Yes you can do it!! If you just are not "into" crafts too much, then at least try to fold a piece of cloth into one petal and at minimum watch the You Tube Videos! and then treat yourself to a purchased kanzashi in SecondLife!